This entry was posted on Tuesday, April 24th, 2012 at 08:58 and is filed under 3a) News and Comments, 3b) The Svensmark Hypothesis. You can follow any responses to this entry through the RSS 2.0 feed. You can leave a response, or trackback from your own site. Yes, this is an amazing return to sanity by the Royal Society ! Abrupt changes in solar magnetic arise from the Sun’s pulsar core or the iron-rich mantle that surrounds it [“Superfluidity in the solar interior: Implications for solar eruptions and climate,” J. Fusion Energy 21, 193-198 (2002)] and probably induced past changes in Earth’s magnetic poles. Please be clear – this is the Royal Astronomical Society, not the grander Royal Society. Am I wrong in assuming the Royal Astronomical Society is part of the UK’s Royal Society? The chain-of-command in the United States leads upward to the US NAS (National Academy of Sciences). I assume the UK’s RS heads a similar chain-of-command structure there. Instinctive fear of the “nuclear fires” that consumed Hiroshima on 6 Aug 1945 have distorted government and science for 66.7 yrs. Think AAS & NAS — a pecking order rather than a chain of command. The pecking order that determines the flow of government funds seems to be the chain-of-command in government science. So what about volcanoes? They porduce huge amounts of C02 and have other effects on local and sometimes global climate (during times of high volcanic activity). Volcanoes are caused by plate tectonics not climate and life. 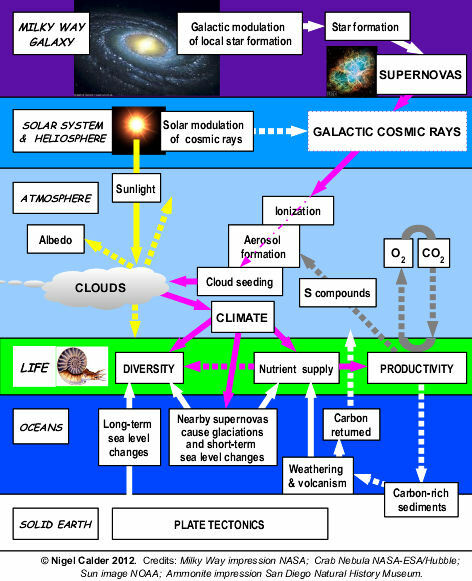 Any also are you saying that the supernova effect influences plate tectonics, or mabye I have not read this correctly? A pertinent point from “a Cambridge natural scientist”. Yes, volcanoes are essential in the CO2 story, for continually recovering carbon rich material that could disappear forever down the ocean trenches. And yes, gigantic eruptions can occur. And no, plate motions are obviously not influenced by supernovae and cosmic rays. But photosynthesis rivals volcanic output. Net primary productivity, strongly influenced by climate, can either outpace the volcanoes, causing CO2 to diminish in the atmosphere and ocean, or lag behind, allowing CO2 to accumulate. So far, Svensmark’s broad brush strokes show CO2 obeying the stars. Some day, when the geological data are better, I would hope that additional variations due to variable volcanic activity might become discernable. I mean of course the long-term downs and ups associated with the formation and break-up of supercontinents, or with the “superplumes” that some geoscientists favour. Short-term climatic effects of individual eruptions (e.g. Pinatubo in the 1990s) last only a few years and are completely lost in Svensmark’s present multi-million-year analysis. Well I’ll be . . . what an interesting, and arresting, hypothesis. I am going to try and read the paper itself but it does look rather daunting. Very encouraging – I can almost hear the gnashing of AGW supporters’ teeth already. BTW, don’t you mean ‘Goldilocks zone’..? Very encouraging – I can almost hear the gnashing of AGW supporters’ teeth already. BTW, don’t you mean ‘Goldilocks zone’..? Of course – I’ll put it right. Bold and fascinating. Look forward to the reception and debate. Excuse my reservations about the marine invertebate genera count though, seems very low- What phyla and classes? Macrofauna only or microfauna included? Are generic distinctions consistent enough to be quantitively indicative of Phanerozoic relative biodiversity? Richard — The data are from a huge enterprise involving millions of fossils, the most thorough for any Phanerozoic biodiversity study, and a big improvement on Sepkowski’s famous efforts. Published as Alroy J. et al., 2008, Science, 321, 97. The abstract reads: It has previously been thought that there was a steep Cretaceous and Cenozoic radiation of marine invertebrates. This pattern can be replicated with a new data set of fossil occurrences representing 3.5 million specimens, but only when older analytical protocols are used. Moreover, analyses that employ sampling standardization and more robust counting methods show a modest rise in diversity with no clear trend after the mid-Cretaceous. Globally, locally, and at both high and low latitudes, diversity was less than twice as high in the Neogene as in the mid-Paleozoic. The ratio of global to local richness has changed little, and a latitudinal diversity gradient was present in the early Paleozoic. Our 259 trillion cubic mile molten rock planet has 310 million cubic miles of ocean, along with 700,000 cubic miles of fissionable Uranium and 1.2 million cubic miles of fissionable Thorium. When these heavy elements decay the by-products are ‘elemental atoms’ under high heat and high pressure that form ‘elemental’ molecules and atoms. These are in direct relation to the cosmic rays. The Universe controls our complete environment, independent of human activity and CO2 is one of these fission by-products. Svensmark’s work is missing this most important relationship, but he is creating a new paradigm. For more on the related science changes see “Becoming a TOTAL Earth Science Skeptic”. Find and Share Truth. In the light of this paper, there’s going to be a lot of the standard textbooks entering the paper recycling loop, and not just in climate science. I like this because for me the relationship between stars and humanity and the evolution of both is an interesting one… being that earth is where humanity places their feet ..an interesting view, theory, place for empirical science. A new paradigm is needed !!! About four years ago, when I decided finally to get grounded in climate change theory, Svensmark’s book, THE CHILLING STARS, was one of the first that I read. It was a very powerful read. Svensmark offers us a cosmic ecology, a way of making sense of terrestrial events–including climate change–as shaped by our place in the Milky Way. This is an enormously important contribution to understanding terrestrial evolution and the possible future of life on Earth. What possible perturbations lie ahead for our little solar system as we journey through the Milky Way? I would be interested to know what Piers Corbyn has to say about this theory. The Boston Struggler. Piers usually scoffs at Henrik’s theory, but I don’t think Piers knows very much about what happened on a geological time scale. It seems that Oliver Manuel, Joe Olsen, Piers Corbyn, Henrik Svensmark, Nigel Calder, and one or two others are all along a similar line or direction of thought, yet, they are so different in some respects. My hunch is that somewhere within lies a better understanding of the truth. So, my suggestion is that we should lock them in a room untill they agree…. LOL. Only joking, they all have already agreed an overall approach, it is called science Science that is not dependent upon state funding obviously. Good idea, Derek, although probably impossible to accomplish. Our ideas survived because of individual stubbornness, but society would benefit if we worked together to show the source of energy that powers the Sun, sustains life, and controls Earth’s climate. Commonality might be recognized if Henrik Svensmark or Nigel Calder commented on what fraction of Earth’s cosmic rays might come from the Sun’s pulsar core http://tinyurl.com/7t5ojrn rather than from distant supernova remnants. Perhaps Nigel Calder has the talents to start such a dialogue? 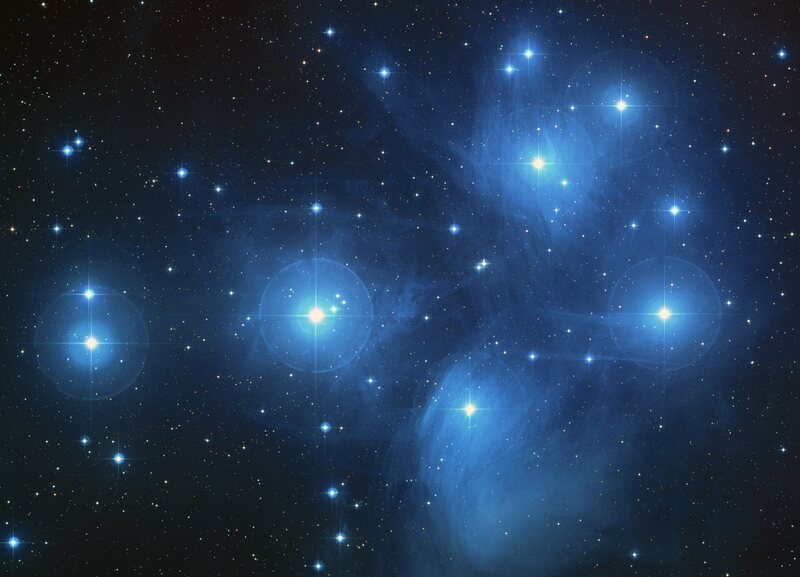 An excellent and thoughtful article; it would also be interesting to hear Nir Shaviv’s comments – would this not be consistent with his ideas about ice age episodes and the Solar System passing through the Galaxy’s spiral arms? As you read the paper you will see considerable reference to Shaviv’s ideas. Svensmark’s paper specifically invokes the passage of the Solar System IN and OUT the Galaxy’s spiral arms as primary determinants of Earth climate. John – much of this blog deals with the solar climate impacts. Please just browse. The result seems to build upon a model of our galaxy with four spiral arms (histogram in fig 11d) where the arms have somewhat different velocity. That seems a little odd and I am trying to figure out if this is a new invention of Svensmark or if there are any other researcher stating the same thing? I think I have seen a comment where Nir Shaviv suggests that our galaxy consists of two sets of spiralarms, one with 4 arms and one with 2 arms. Isn´t that more plausible? Bengt – The large astronomical part of Svensmark’s paper makes no initial assumptions about the shape of the Galaxy but works from star clusters, presumably formed in the spiral arms. In the process he finds that the shape is different inside and outside the “solar circle” – the orbit of the Sun and planets around the centre of the Galaxy. Thanks, Maccad – but please make that BBC-TV scriptwriter. I hope that’s not what Svensmark’s paper argues, for supernovae don’t emit cosmic rays– they *accelerate* cosmic rays produced elsewhere (where, we don’t know). Nigel, you say “we may be very lucky in our location in the Galaxy”. May I suggest that you could equally have put it the other way round – we are here now because of our location in the Galaxy. omanuel – it was the Rotal Astronomical Society, not the Royal Society. But the RS will turn too. thank you nigel, an excellent article, and the quote above is particularly dear to my heart. 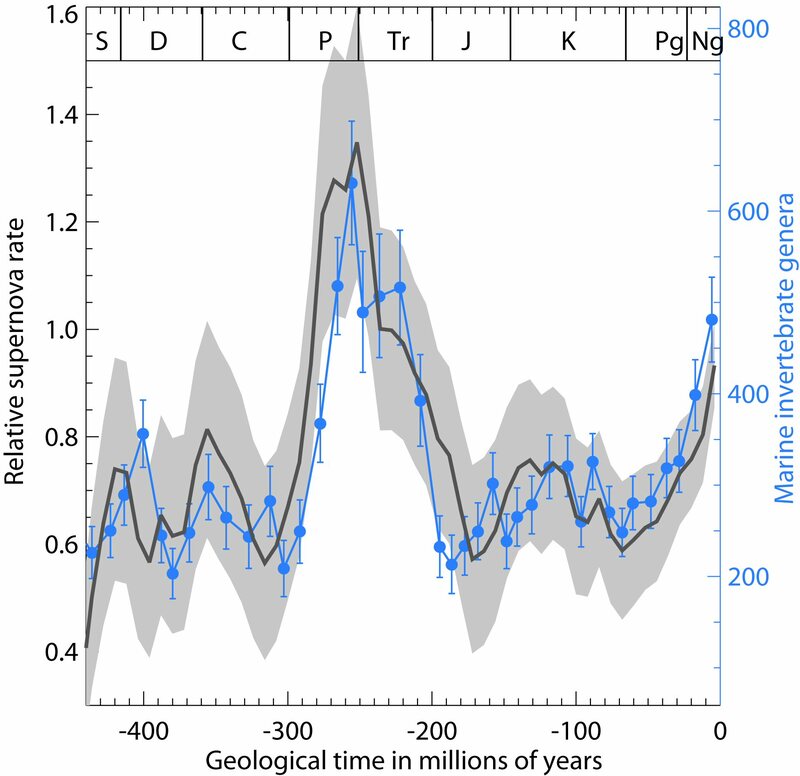 assessment of climate drivers during the last ONE million years. cheers for that, interesting read. been a while since i have read geological papers, a pleasant change of pace. Thank you very much Nigel for this update on Henrik Svensmark’s work. I have written sometimes about his theories in my blog so now there is time for an update there! Life on Earth has been evolving and trying to ‘understand’ the Universe since it (Life) first began. People, of various kinds and sorts, have been leading the herd for 4 to 6 million of those years on this particular speck of dust in the middle on nowhere. Most conservative estimates would surely agree, I think, that we (Life) have only just begun to scratch the surface of the mystery. Would seem that one of us, named Svensmark, has hit on something new and meaningful. Let’s hope so. Wow. This is real nobel prize-winning work, not crap like IPPC and Al Gore. Betelgeuse is approx. 600 light years away. It could have exploded yesterday and we won’t know for 600 years. In cosmic terms that’s like your next door neighbors house blowing up. It would be interesting to see how that plays out in the far future. Sent the link “See the RAS press release” above and a brief note to DrudgeReport. It’s certainly BIG and NEWS. Taking nothing away from this magnificent achievement of Svensmark the present implosion of biodiversity is anthropogenic and the fault lies in our selves not in our stars. So our fate really is written in the stars. Just not in the way that’s normally meant. Congratulations on being honoured in the acknowledgements! It’s an amazing insight into our seemingly fragile place in the cosmos. The sea-level explanation is welcome. Those Vail Curves are a mystery begging for a decent hypothesis, which sudden stochastic events like SNs fit rather well. This will never fly… simply makes too much sense AND there is no money to be made or gov’t regulations that can be issued. Here’s a question… what is the Earth’s temperature supposed to be? Congratulations to both Calder and Svensmark! I agree! This is an important break in the consensus dam of lock-step misinformation about the source of energy that powers the Sun, controls Earth’s climate, and sustains life. Just read the original paper…one word …magnificent. Simplification is ‘beauty’ in science. One other thought… has this been reported by the BBC yet ? Henrik was interviewed for a few minutes on BBC Radio Scotland on 24 April — otherwise nothing. Beyond this, at the philosophical level, Henrik lifts our minds to broader horizons, and helps to cut a swathe through the blinkered obsession with the terrestrial atmosphere shown by climatologists. It is important, but can now be seen in the context of bigger driving forces:- The passage of the solar system through the galactic spiral arms, the planetary forces shaping the Milankovitch cycles and resonating with solar variation, and the nearby supernovae which can cause deep and rapid cooling of the climate. This is an amazing article, I think everybody should know about Svensmark, I think he is a modern genius, on a scientific level he has married together a lot of misunderstand phenomena and disparate topics into a coherent and logical framework, which Calder makes it easy to understand. On a spiritual level, I think it is fascinating to understand that life on Earth can be affected by events in the distant cosmos. I love Svensmark’s hypothesis so much I wrote a novel about it! but I’m not plugging my book on here as I think that would be impolite. I do feel sorry that Svensmark’s work is not more clearly recognised by the general public, all the inflamed rhetoric about “global warming deniers” is really preventing his work from being promulgated more widely, although eventually I believe it will be become one of the outstanding theories of modern science. I wonder if you could comment on the temperature aspect of this. Svensmark is saying that glacial conditions are good for life. That seems to be the opposite of the last few million years, when the ice ages killed life and the interglacials promoted it. And many warm eras such as the cretacious had vast amounts of life. Ian Plimer and others also say warmth is good. Any thoughts? Very cold or very hot can be nasty for life, Ron, but the planet is best fertilized with some ice at the poles. The temperature contrast with the tropics provides the motor for the wind and weather that keep the nutrients circulating. The idea that warmer should usually be better is an example of the basic misconceptions that Svensmark challenges. 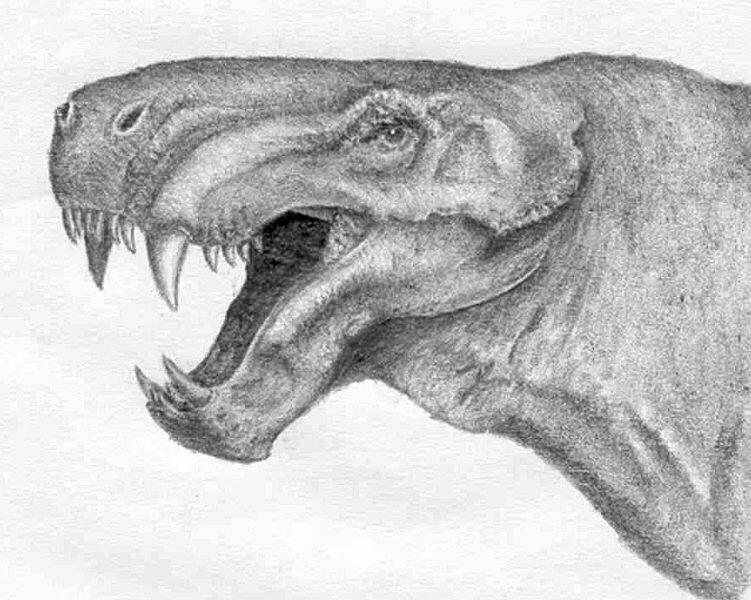 Superficially impressive though the Cretaceous was at times (e.g. 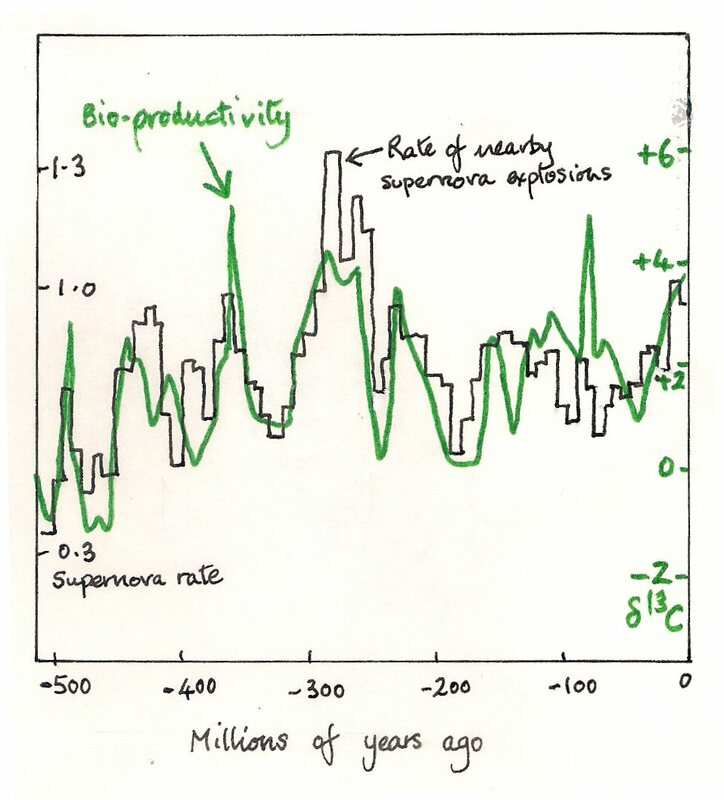 the vast chalk deposits) the net global primary productivity was on average less than it is now. What a fascinating and eye opening article! I’ve been following Svensmark’s theory for 10 years now. Great to see how things come together. Not only is it an extraordinary piece of intellectual work, but it also taught me a valuable lesson on critical thinking and positive skepticism as a student about to finish high school at that time. From recent history (last 5,000) years it is clear that “warmer is better” as measured by the rise and fall of empires. However, let us not forget that even though we are in an “Interglacial” it is still part of an “Ice Age”. The average global temperature during the PETM (~ 65 million years ago) appears to have been at least 10 Kelvin higher than today. According to Svensmark bio-diversity was lower than at present. Surely warm weather would expand the viable range for fauna and flora so that hippos could be found in London and alligators in Spitzbergen. Given that the poles warm much more rapidly than the low latitudes the temperatures gradients in the atmosphere during the PETM must have been small compared to today so storms would have been weaker. Would this have had an adverse effect on bio-diversity or bio-productivity? Nigel, I suppose you have read the leaked IPCC AR5 draft concedes a solar-climate link? Does that prompt you to return to blogging? Your posts are missed. I’m afraid it’s the usual thing — they mention the Svensmark hypothesis only to conclude it’s unimportant. But thanks for your kind words, Don. I’ve neglected my blog since May because my wife (and agent) Liz has been ill. She’s on the mend, though, and I’ll try to be more active in the New Year. Meanwhile I’m content to leave the “stellar revision* prominent, because it’s one of Svensmark’s finest pieces of work. Thank you for the update. We have supposed that personal health might be at stake in your family. Your thoughts here are indeed missed. I grew up on your books, and became the youngest founder of my American state’s (Minnesota) astronomical society. I followed my uni-mates into and out of science (they are all academics). We admire your indefatigable spirit, even as compromises must be made in time – the rarest of all gifts we can share. Thank you for your “ride” here, online! Having followed the saga of global warming since reading Nigel’s beautifully produced book, “The Manic Sun” in 1997,I think it is criminal that the Svensmark theory has not received equal publicity to the now discredited IPCC publication “Climate Change 1995”. This is partly due to political pressure but mainly due to the obscene sums of money (astronomical, one might say) being spent on so called sustainable sources of energy. It must surely be time that the scientific community was allowed to bring all the evidence out into the open and come up with a proper scientific theory of climate change on which governments of the world could base their future energy strategy. World leaders and their advisors are not yet willing to admit reality. The sun is like the Hindu Trinity: The creator, sustainer and destroyer of lives and worlds. Nigel, have you seen this? “For decades, scientists have argued over whether there is a link between cosmic rays and cloud cover, which in turn could affect climate. Now two atmospheric physicists in the UK have discovered that global atmospheric electricity – which itself is altered by cosmic rays, space weather and El Niño – affects the base height of certain types of clouds. Thanks, Don. This is the “other” cosmic-ray/cloud story used here as another way of poohpoohing the Svensmark hypothesis. With summer over, and the next IPCC “report” shortly upon us – your readers wish you and yours well, Nigel! To us, your lifetime of service to country and the world of science education are worthy of high honors. (OM) or (CH) at least. Instead, you join those whose farsightedness will come in due time – perhaps not soon enough. But those who know better need to add our loud THANKS to you, now. THANK YOU, Nigel Calder, (OM) [as recognized by this independent-minded Yank]. “Wavelet analysis of TD1 indicates that six out seven cities investigated exhibit periodicities near 11 years, three of them significant at a 1% significance level (p<0.01). Furthermore, wavelet coherence analysis demonstrated that the 11-year periodicity of TD1 and solar activity are correlated with an anti-phase behavior, three of them (the same cities with periodicities with 1% significance level) significant at a 5% significance level (p<0.05)".."The existence of periodicities around 11 years in six out of seven cities and their anti-phase behavior with respect to 11-year solar cycle suggest a global mechanism probably related to a solar magnetic shielding effect acting on galactic cosmic rays as an explanation for the relationship of thunderstorm and solar activity"
Graph “C” units are confusing, now they look like A=C, which is true only when k or B is 0. Yes, I understand the modification, but the numbers on the left side of graph C are too similar to graph A, this can not be correct (or is correct only if there’s no correction applied at all). This is a minor problem, indeed. Not a minor problem, Allan – not a problem at all. Sea level changes produce ups and downs, and changes in the supernova rate do the same. The difference remains in the spread of genera counts. I need not have done so, but it did. In 1054 AC a star exploded in the constellation Taurus. The remnants were discovered in the 18th century as M1 or Crab Nebula. Is there any correlation with the Medieval Warm Period? No link, Reinder. A supernova remnant does not generate a brief pulse of cosmic rays, but becomes increasingly active over thousands of years. In any case, increased cosmic rays would not warm the Earth but cool it, by the Svensmark effect of increased low cloud cover. It is good to see you are still there, NIgel. I hope you will be continuing this blog as there seems to be plenty happening which could do with your commentary. Thanks, Philip. But I’m nursing a sick wife and I’m not sure when I’ll get back to the Updates. I do keep an eye on what’s going on.